There are quite a few big name stores and websites that you can set up a baby registry on. Deciding which one can be overwhelming. When I was pregnant with my first baby, I started 3 registries at 3 different stores…Seem extreme? It was but I was confused and saw things I liked at this store but not that store, etc. So 3 registries it was. I did not even consider Amazon for a registry. Mostly because I had no idea they even had that option. Looking back, Amazon would have been the perfect registry. I have been an Amazon Prime member for years as well as Amazon Family (formally Amazon Mom) which has awesome coupons so having a baby registry at Amazon would have been a great fit for me. Not only does Amazon carry over 250,000 baby products, it’s competitive pricing makes saving money really easy. So, How Does Amazon Baby Registry Work? Amazon Baby Registry works like any other registry. You are able to sort through thousands of items from diapers to strollers to breastfeeding products with a click of a button. When you find items you like, you simply add them to your registry. You are given a link so your friends and family can easily find your registry or they can search by name from Amazon’s main page. Easy Peasy! Here’s how that works: Select items that you personally purchase from your registry within 30 days of your baby’s due date (up to $5000) and you get an extra 10% off. Amazon makes returns easy and fast. A big plus is no waiting in line at a store! And don’t worry, Aunt Betty won’t know you returned her gift. So after reviewing your registry, they can head to their local baby store and buy any of the items and then mark it off your registry. This is a great feature to help cut down on duplicate items and appeal those that don’t want to order online (or who procrastinated and need a gift same day…). Amazon has so many products that you really can find everything you need and some you didn’t know you need. Yes, you read that right, you can add products from other sites to your Amazon registry. So, if by some chance you like an item not carried by Amazon and want to add it to your list, Amazon makes it easy! It is done by simply adding a tool to your browser from the Amazon site. You can get that tool here. It does require that you use a desktop computer, however. You simply go to the Amazon tool page, drag the “Add to Registry” button up to your browser tab, and anytime you are on another site you can use the button to add to your registry. Great option if you see an item that Amazon does not carry so you can keep all your items on one list. What is the Difference Between Amazon Prime and Amazon Family? I mentioned that you can get 15% off instead of 10% off to complete your registry if you have Amazon Family. The question is asked a lot about what the difference is between Amazon Prime and Amazon Family. So let me clear that up. The best feature of Amazon Prime to me is the free two-day shipping. One of the best parts about using Amazon is the huge savings you can get on certain items. If you add shipping costs when you buy online, it cuts into the savings and can make it not worth it. So having free shipping on unlimited items at any price is huge. I can’t tell you how many times I have ordered something only to find it on my doorstep the next day. So it is fast! Amazon Family is basically an add-on to Amazon Prime. It is free to sign up for Amazon Family if you have a Prime account. So not completely free since you have to be a paying Prime member. Optional access to Amazon FreeTime Unlimited – An all-in-one subscription for kids that offers unlimited kids books, movies, TV shows, apps, and games. This service is an extra $2.99 per month. I would say the main benefit of Amazon Family is the coupons. You can get some great deals on diapers using the 20% off coupon. That’s huge! The other deals and coupons are good too. You can get discounts on items like shampoo, clothes, grocery items, etc. The savings can really add up. Plus with your two-day free shipping, no more running out to the store last minute! Signing up for an Amazon Baby Registry is easy. Just click here: Shop Amazon – Create an Amazon Baby Registry and click on Start a Baby Registry. Then start adding your items! Or click the Banner below to get started! 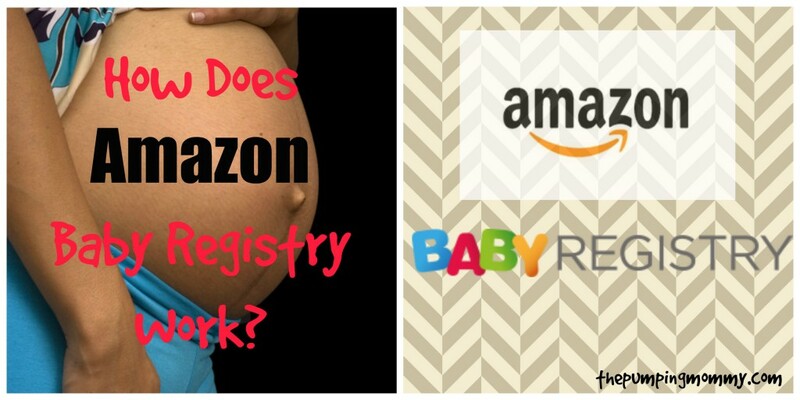 Have you used Amazon registries before? What do you think? Have questions? Leave me a comment below! Previous Post: « Spectra S1 vs Spectra S2 – What is the Difference? when an item is purchased from the baby registry do the recipients know who bought it? The shower is a month away and my nephew is already saying thank you for the gifts!! P.S. The gifts were sent to my house. Yes! There is a “Thank you note” feature where the registry owner can see who made the purchase and send a thank you note. There is also a “Don’t spoil my surprise” setting a registry owner can use that does allow them to see any of the gifts purchase so they can be surprised at the shower. Sounds like your nephew is checking the registry and already using the thank you note feature. Hello 🙂 I just had my baby shower yesterday and there are about 20 small items remaining on my amazon registry. Within the next few days, my husband and I plan to purchase the remaining items on the registry. I’m a prime member so I know I’ll receive 15% off, but I’m confused as to 15% of what? Is it 15% of the last items that are in my cart (which will be $250 worth) OR is is 15% of the total items that were purchased by myself or anyone else that said “completion discount eligible”? For example, say I had $500 worth of items on the registry that were eligible for this discount, would I receive a discount of 15% of 500? Or would the eligible items in my cart while completing the registry be the only things discounted? I apologize if this is confusing! I know babies R us sends a gift card worth 10% of what was purchased from the registry if it’s completed before the baby’s due date. So our babies R us registry is now completed and there was a total of $1,400 spent… so in 12 weeks we’ll receive an ecredit from babies R us for $140. I wasn’t quite sure if the 15% discount from amazon worked in a similar way, applying to all eligible items in total or just what’s in the final shopping cart. Congratulations on your little one! It is confusing, I agree! With Amazon, the 15% will apply only to the eligible items that YOU purchase. So anything that is left, you go to the redeem the completion coupon button from your baby registry page and all eligible items will appear. You have to add the items to your cart from this view only. The discount will show at checkout. I would love to see Amazon do something similar to Babies R Us with the credit they give back for the total amount purchased. That is a great feature. But the 15% for Prime members on Amazon is not so bad either. I hope this clears it up and I wish you a healthy and happy pregnancy and birth! Thank you for sharing this info. It was very helpful. I am glad it helped, Sam! It all can be very confusing. Thank you for your comment! Will people ordering off my registry have the same benefits as me as a prime member in terms of shipping and discount prices? Great question! Standard shipping rates will apply based on the person actually ordering from Amazon, not based on your membership. They will be eligible for free shipping from Amazon on orders over $49, however, if they are not a Prime Member. Most baby registry sites do charge for shipping (unless it is going to a store for pick-up) so I think this is pretty standard. One nice feature of the Amazon registry is that you can add items from various sites to it. So if there are some items you want to give people the option to pick up in a store, you could just add that item from a store like Target, etc. You don’t have to add just Amazon items to the registry which makes it a nice place to consolidate your registries instead of having 2 or 3 different ones. Are you automatically a member of Amazon family if you are a prime member? I am a prime member and my little bundle of joy will be here in less than two months. I haven’t started shopping at all. It will be easier for me to do it with Amazon because of their excellent range of products like you mentioned and very competitive prices. Yes, if you already have a Prime Membership then you qualify to sign up for Amazon Family at no further charge. Just go to http://www.amazon.com/family to update your profile. Once you sign in you should be able to add it. Then you will start receiving coupons for diapers and other benefits. Then, if you create a registry, you get the added benefit of being a Prime member. Good stuff! Congratulations on your baby!